Top-notch rumors from the web. First came the notch, and we all put up with a black shape at the top of our phone screens in return for some extra room on the display. Next, apparently, is the cut-out pinhole variation on the notch – a single hole for the front-facing camera, surrounded by screen. We already know that these kind of phone designs are on the way (see the Huawei teaser image above), and we've even got a name in some cases: Samsung is describing the look as an Infinity-O display. However, we haven't seen much in the way of actual hardware – until this weekend that is, as a flurry of leaked images hit the web in quick succession. Starting with Samsung, we don't have a picture of an actual device, but we do have screenshots logged with US regulators, showing a space in the top left corner. This is probably the design that will appear on the Samsung Galaxy A8s. 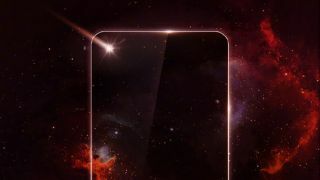 Then there's Lenovo – a grainy video of what is claimed to be the Lenovo Z5s just hit the web, showing a pinhole cut-out in the center up at the top of the screen. It gives you a good idea of what this kind of design is going to be like to use. And earlier this week we saw what is supposedly being called the Huawei Nova 4 revealed in a live online broadcast from China – during birthday celebrations for singer Jackson Yee (look him up). Again you can see the phone display and its cut-out clearly on show, which suggests the phone is about to be launched, perhaps as early as next week. The question now is which company will get a handset out of the door first. Both Samsung and Huawei have been keen to get that "first" badge of honor in the past (quad-lens camera, anyone? ), so they have to be the favorites right now.